▶ SoldThis listing was sold on May 23, 2018 for the price shown here. Price Reduced - easy to show & sell! 2 Story home with 4 bedrooms, 2.5 bath, 2 car garage - Living room w/crown molding, sep dining, spacious family room w/woodburning fireplace & brick surround. Kitchen has granite tiled tops, light cabinets, new appliances (9/2017) that walks out to 12x10 new deck (9/2017) that overlooks private backyard & backs to trees. 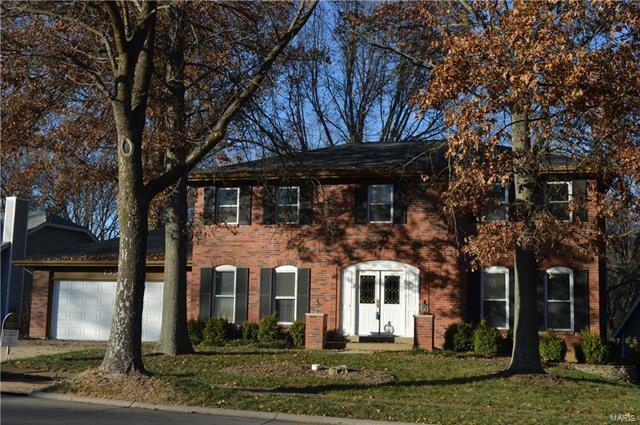 Large master suite has sitting room - updated bathroom w/ tiled shower, floors and huge walk in closet. UL Hall bath is also updated with tile and cabinet. Walk out lower level is unfinished but has plenty of room for to finish to you liking. Home also includes: tiled foyer,6 panel wood doors, exposed treads on stairs, oversized garage, new roof 2017,new paint (9/2017), new appliances (9/2017), new flooring in living room/great room/dining room (9/2017), some updated lighting. Parkway Central High School District. Optional Bridle Creek pool membership -across the street - $200/year. MINUTES FROM 40/SHOPPING/DINING/ENTERTAINMENT! Schoettler to Highcroft. Or Chesterfield Parkway West to Highcroft.